Do you find yourself in a constant state of crisis at work? Are you bombarded with petty little issues to resolve? Do people regularly come to you with problems that they could easily solve, but don’t. Why is it they want you, their leader, to fix it? How should leaders manage crisis and resolve issues? I asked my Twitter audience this question. Here are some of their responses. 1. Listen. 2.Surround yourself with good people. 3. Taking a stand on something/making decisions. 4.Keeping a clear head =Avoids crisis management. Most people see problems as a blame seeking exercise. Destroy that culture and problem solving gets more creative and productive. Good leaders resolve issues, through dialog, collaborative problem solving, personal reflection, and empowering others to act. Many executives find themselves in a daily crisis management mode? Learning to make issue resolution a shared responsibility throughout the company is the key to changing this scenario. A crisis is a turning point or a conflict that is emotionally volatile. How does a simple issue become a crisis that requires executive leadership action? The system of management in many organizations requires issues to be resolved by the senior most person. This need for a high level of control forces issues to bubble up to the top, developing into a crisis by the time they get there. High control leadership cultures are crisis-centric ones. Not only is a crisis created out of a resolvable situation, but the crisis is allowed to develop to justify the high control in order to maintain the illusion of leadership. Yes, the illusion of leadership. Effective leaders expand the leadership capacity of their organization through the development of people. Training them in the attitudes and behaviors of leadership is part of the solution. Changing the system of issue resolution is also needed if the culture of crisis is to change. Here are five principles to guide the development of a leadership system of issue resolution. 1. Issues should be resolved where they begin and by those who are empowered to resolve them. This is the first and most important principle of issue resolution. The only exception to this principle is when a change in policy or strategic direction is required. Here’s an example for how this works. An issue arises on the shop floor between a machine operator and the maintenance supervisor. Ignored, the issue begins to involve more people. The shift supervisor gets involved. Then the union rep, and the department manager, and finally it ends up as a topic for the business unit’s leadership team. By then, the issue has grown beyond the two people who disagreed on some procedure, and has become a negative talking point about the company involving everyone in the unit. The crisis began when the two people who disagree could not resolve their differences. They deny that it is their responsibility for doing so, and pass the issue up the line. This system allows for all sorts of twisted logic so that no one takes responsibility for the issue and life in the shop and throughout the business unit becomes contentious and unpleasant. All because two guys won’t resolve their disagreement. The high-control executive gets to play the rescuer who has all the answers and brings peace and harmony back to the company. What he or she has created is a culture of disruption and division. If there is only one person who can save the day, it means no one else is allowed to do so. In effect, the system is designed to constantly make the executive look strong and able, and the rest of the company weak and needy. The system has to change. The issue could have been resolved where it began, by these two workers. Ever had a misunderstanding with someone, and immediately, you knew it, and resolved the issue. You clarified your statement. Apologized for the misunderstanding. Reconciliation made. Issue resolved, and crisis avoided. This happens when the two or more parties to the issue take initiative to resolve it. This is the leadership capacity that every organization needs from top to bottom. Genuine leadership requires each person to take initiative in the three dimensions identified in the diagram above. 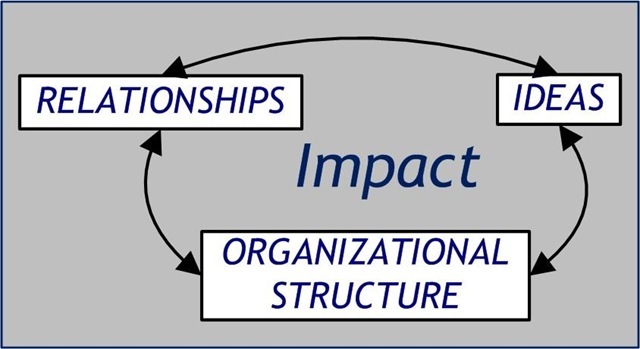 An issue originates in either the Ideas, Relationship or Organizational Structure dimension, and is resolved by bringing all three of them together. In the situation above, the issue could have been caused by poor communication (Ideas) or a process (Organizational Structure) issue. Or it could be that these two people do not like each other (Relationships), and their contentiousness creates an issue where there really is none. 2. The manager or supervisor at the next highest level in the organization is responsible for making sure that issues get resolved at their source. Supervisory leaders need to understand that they are the company’s first line of defense against an issue becoming a crisis. The problem is that most supervisors are not trained to be leaders, but are trained to manage work processes. Leaders lead people. Managers manage processes. People need people who function as both leaders and managers. 3. Train middle managers and supervisors to identify and resolve issues as they arise. If your supervisors and managers are not equipped to lead people through issue resolution, then you must train them to do so. Leadership training for middle managers and supervisors in many companies is viewed as a non-essential expense, and is cut when budgets are tight. This is short sighted, non-strategic and creates the conditions where issues become a crisis. Training the leaders from the middle of the company is an investment in a more adaptive workforce. 4. Issues should be resolved to enhance communication and coordination. Issues are a function of the dynamic context seen in the diagram above. The Circle of Impact is a simple set of guides for assessment, problem-solving and planning that are best used in conversation. Here’s a real world example to illustrate. A leadership team meets at 1pm every Wednesday. The members of the team arrive and the team leader, their boss, presents the agenda for their meeting. Week in and week out, the meeting is about her issues. The issues of the other members are rarely addressed. Team members express feelings of a lack of respect from their boss. Issues remain unresolved and poorly understood. What is the issue here? Is it a relationship issue where the senior leader truly does not respect her team? Is it a lack of awareness that there is an issue? Is it a problem of poor communication or organization of the weekly meeting? Identifying the issue doesn’t resolve it. The team leader telling them she does respect them doesn’t resolve it. Vague promises of doing a better job of communicating doesn’t either. Changing the structure of the meeting to enhance communication and issue awareness is the solution. The team makes a simple and strategic change in their meeting structure. Each team member submits agenda items for Wednesday’s meeting by 1pm on Monday. By 1pm on Tuesday, an agenda is distributed to the team so they know the topics to be discussed and how to prepared to contribute. The solution impacts the team beyond their initial expectations. Over several months, the team finds that issues begin to be resolved prior to the meeting. As their awareness of issues increases, communication improves, and decisions are made and implemented more effectively. Meetings are less issue oriented and more strategic as a result. 5. Senior leaders create an environment of confidence and personal responsibility by not resolving issues that should be resolved at their source, and supporting the parties in their issue resolution process. Leaders create a culture of leadership with a system that validates personal responsibility and initiative. People gain confidence and accept the call to a higher level of participation and contribution when their decisions are supported by the company’s leadership. A culture of leadership is not created by policy making alone. Leaders in the middle need to be trained to lead. They are the key to future strength of the business. Equip them to lead within their role and responsibilities, and they begin to equip the people who work with them to lead as well. Issues occur everyday. The crisis level of issues is minimized by developing responsibility for issue resolution throughout the organization. As a result, developing a system of issue resolution as described here should be one of the key goals that executive leaders pursue. Tagged with crisis, issues, leadership, managers, supervisors, training.